Do you know where your water comes from? Much of Northwest and Central Arkansas rely primarily on reservoirs fed by surface water runoff for their water needs. However, many communities throughout the U.S., including the Mississippi Alluvial Plain (MAP) in Eastern Arkansas, are dependent on groundwater for irrigation, commercial, and public water supplies. The MAP extends across 7 states from Southern Missouri to the mouth of the Mississippi River in Louisiana. Over 9 billion gallons of groundwater are pumped from aquifers within the MAP each day. Much of the pumping is from the surficial Mississippi River Valley Alluvial (MRVA) aquifer for irrigation and agricultural production, supporting a $2.5 million agricultural economy for the state. Public supply of drinking water in Arkansas also relies on groundwater from the MRVA aquifer and more so from deeper units of the Sparta aquifer. This level of use has resulted in significant declines in groundwater levels throughout the region. As groundwater levels continue to decrease, both economic and environmental concerns may arise. Lower groundwater levels in the MAP region could result in greater costs to producers to pump water to the surface for irrigation. Groundwater declines have already resulted in decreases in baseflow and stream drying in the summer months for many streams in the MAP region. In order to mitigate these problems and more effectively manage this water resource, an accurate estimate of water availability within the MAP region is crucial. Map of the extent of coverage of the Mississippi Alluvial Plain. Decades of monitoring and research into groundwater levels, water use, and water quality has been conducted to address concerns of water availability in the MAP region. More recently, the U.S. Geological Survey (USGS) has kicked off the MAP Regional Water Availability Study, which partners with several federal, state, and local government agencies and producers in Missouri, Mississippi, Louisiana, and Arkansas including the Arkansas Natural Resources Commission and the Arkansas Department of Health, in efforts to study water availability within the MAP. “The project leverages historical data, newly collected data, and innovative new approaches to monitoring, mapping, and modeling to provide water resource managers with information and tools to best manage available water resources” says Wade Kress. Kress is the primary investigator for the study, located at the USGS Lower Mississippi-Gulf Water Science Center in Nashville, Tennessee. Specifically, the MAP study group is working with water resource managers to develop new groundwater level and water-use monitoring networks, expanding on existing networks and leveraging modeling to assess where new data would be most beneficial. Expanding these networks will allow for a better understanding of how water levels fluctuate throughout the year due to irrigation practices and recharge, or replenishment of water into the aquifer. To further evaluate properties controlling recharge, groundwater and surface water exchange, and storage capacity of the aquifer, the MAP study researchers deployed a large-scale geophysical mapping initiative. The geophysical program uses continuous resistivity profiling methods across the land, along stream channels, and from the air via helicopter to generate 2- and 3-dimensional maps of the aquifer system. Resistivity profiling is done by measuring how much electric current passes through the earth, which can tell researchers how much water is there. Groundwater level monitoring, resistivity profiling, groundwater chemistry, and other tools are being integrated to gain a better understanding of the recharge, evapotranspiration, runoff, and storage in the MAP, which ultimately will be used to update the water budget for the region. Coupled with groundwater flow simulations from the Mississippi Embayment Regional Aquifer Study and climate change predictions, this study will be able to determine the regional water availability and predict changes under different management scenarios. Members of the MAP team will host a session at this year’s Arkansas Water Resources Center conference to present their findings from the past year. Their session will be held on Wednesday, July 31 at the Fayetteville Town Center. Additional details about the USGS MAP water availability project can be found here. 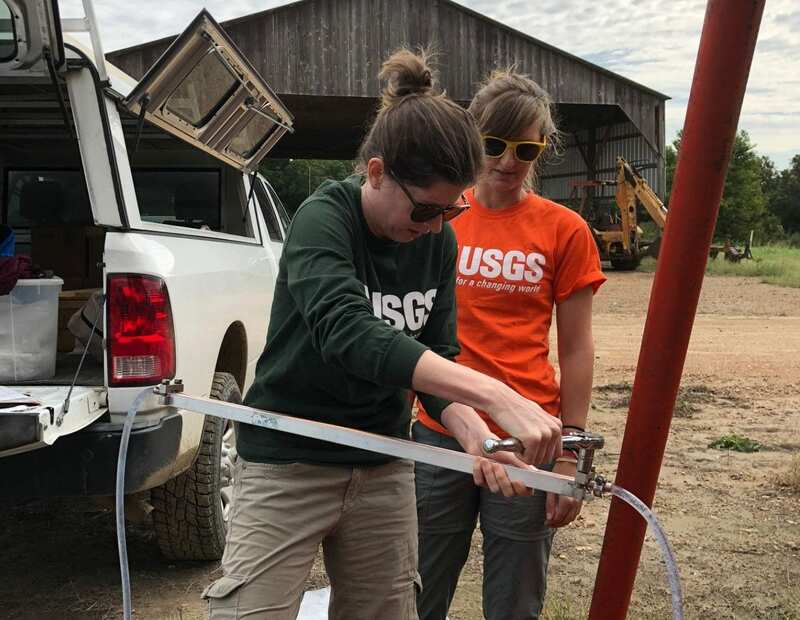 Banner photo: Dr. Kathy Knierim and Dr. Courtney Killian collect groundwater samples from the Mississippi River Valley Alluvial Aquifer.